**The contest has ended. Congrats to Jane Croger! Check out the latest giveaways where you can win a radically fabulous autographed art print or a radically fabulous workout DVD from a celebrity trainer! The Radically Fabulous My PeepStakes is sponsored by a remarkable trio of female entrepreneurs – Melody Burns of Kiini Ibura Jewelry, Karen Tappin of Karen’s Body Beautiful and Kym Rodgers of CakeJoy. 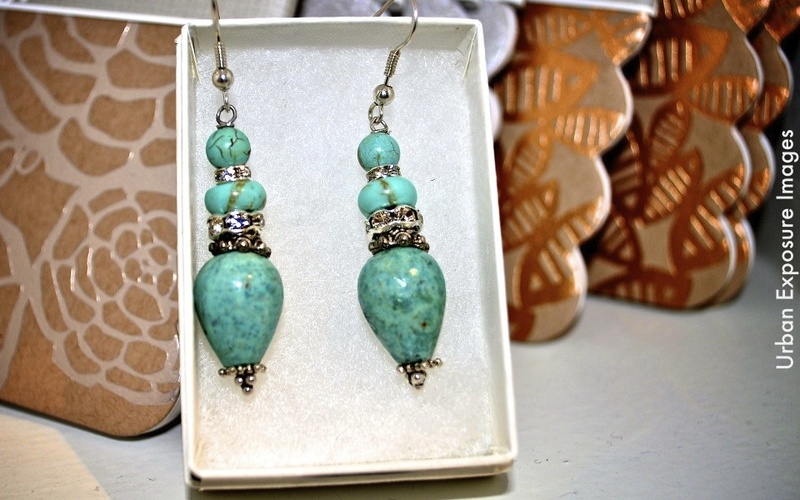 Because of these super classy chix one lucky person will win a pair of Kiini Ibura Smooth Turquoise & Austrian crystal earrings (specially designed for this contest); a $25 Karen’s Body Beautiful Gift Certificate* & a $15 Cake Joy Gift Certificate*. A prize package worth $125! Entry is FREE. But in order to qualify you must be a SUBSCRIBER of The Socialite Design. Have no fear; if you’re not a subscriber yet there is still time for you to join the cool kids and enter to win! Contest runs from March 10, 2011 until March 20, 2011. Subscribing is free and easy. Just look in the upper right hand corner, type your email address in the designated slot & click “Sign me up!” Then check your inbox (and spam) for the confirmation email. Once you confirm, you’re in and on your way to exciting adventures and possibly winning a prize package worth $125! For a chance to win the $125 prize package, you must subscribe and correctly answer all of the following questions by March 20, 2011 (HINT: The answers can be found on The Socialite Design and sponsoring websites by clicking on the underlined key words in each question. It’s the easiest open book test ever!) Use the contact form at the end of this post to transmit the correct answers to me. Persons scoring a Perfect 12 will be entered into a drawing. Only one person can win! Good luck! What specific project inspired me to create The Socialite Design? What was my debut event? What is my favorite DJ Spinna record? What is a betel nut beauty? At what age did MacDella Cooper flee her native Liberia? Which young burgeoning star shares my taste in jewelry? Isaiah Washington recently became a citizen of what country? Which TWO (2) designers provided my gorgeous L’Africana Night wardrobe (gown & accessories)? Which celebrity appeared on The Oprah Winfrey Show wearing Kiini Ibura Jewelry? What is the name of the promotion that Karen’s Body Beautiful runs every Friday. What time does CakeJoy close on Sundays? What is the date of the next Fort Greene Snap WordPress Websites Class? *Gift certificates must be redeemed in the store. If you are an out-of-towner, you’ll just have to take a trip to the East Coast or donate the certificates to a deserving New Yorker. 😉 Earrings will be shipped to the winner’s address; U.S. only. 1) In order to qualify to win you must become a subscriber of The Socialite Design by March 20,2011 at 11:59pm est. 2) Only one entry per person. 3) It’s my game and my rules, so I reserve the right to cancel the contest at any time or extend entry dates. Yep, just like on the playground. 5) Contest ends March 20, 2011 at 11:59pm est. 6) The drawing will be conducted by Fort Greene SNAP on or around Tuesday, March 22, 2011. The winner will be announced on The Socialite Design soon after the name is drawn. Since you must be a subscriber to claim the prize that means you’ll be notified via email immediately after I post the name of the lucky person! Nestled in Fort Greene, Brooklyn Kiini Ibura Jewelry is the official sponsor of The Socialite Design. It has become the go-to boutique for unique, handcrafted accessories. Designer Melody Burns uses precious and semi-precious stones like Ghanian glass, fresh water pearls, African amber and Austrian crystal to create dazzling one-of-a-kind pieces that can complement a gorgeous Red Carpet gown or glam up a plain white tee. Saunter down to the 3rd Avenue YWCA to catch Kiini Ibura Jewelry along with 20 radically fabulous designers at the The Diaspora Artmart on March 26 and April 16 from 12 – 7. There will be live entertainment and plenty of hot fashions! Founded in 2004 by Karen Tappin, Karen’s Body Beautiful is a Brooklyn-based luxury beauty line and spa created to provide the purest, highest quality of all-natural products for the body. The brand boasts an extensive offering of natural, luxuriant, emollient-rich body products created for hair, body, face and bath time. Comprised of all-natural ingredients such as shea butter, jojoba oil, aloe butter, olive oil and apricot kernel oil, the Karen’s Body Beautiful line is offered in 13 amazing fragrances and provides the very best in all-over body care for women, men and children. Karen’s Body Beautiful promotes the belief that the maintenance and celebration of the body translates to the elevation of the spirit. CakeJoy is an upscale dessert lounge in Fort Greene Brooklyn that offers a wide variety of exotic cakes and cupcakes using both imported and domestic fruit and liqueurs. Specialty treats like Mojito Cupcakes, Champagne Cupcakes and Piña Colada Cupcakes and our famous Red Velvet Cheesecake have become fan favorites. In addition to these blissful desserts, CakeJoy offers Carrot Cake Cheesecake, Brownie Cheesecake, “The Cookie” and bite-size brownies that melt in your mouth.